This one was my trial n error recipe. I was thinking how the taste would be because my hubby doesn’t like soya chunks. And every-time i force him to eat it. Well, after tasting it i am very much confident that he wouldn’t find i have mixed soya chunks too 🙂 Kids who hate soya will find it more interesting. Do try it and enjoy. Soak the soya chunks for 30 mins. Squeeze out the water and blend in a mixer to powder. Heat oil in a kadhai or pan and temper mustard seeds. Add cumin seeds and ginger-garlic paste. Fry for 2 mins. Add mashed potatoes, blended soya chunks, turmeric powder, red chili powder and salt to taste. Cook for 2-5 mins and keep aside. 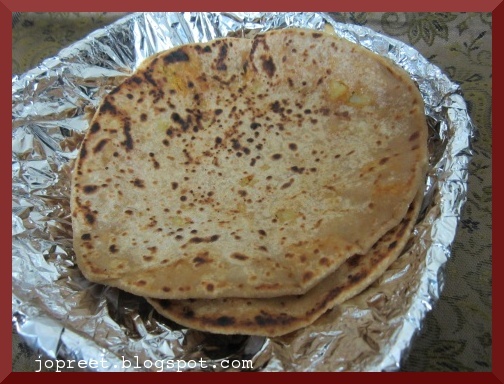 Nice and different filling..parathas look so tempting. Parathas are too healthy dear. Fantastic stuffing, simply loving it. I am not a big fan of soya chunks either…but this one sounds interesting.